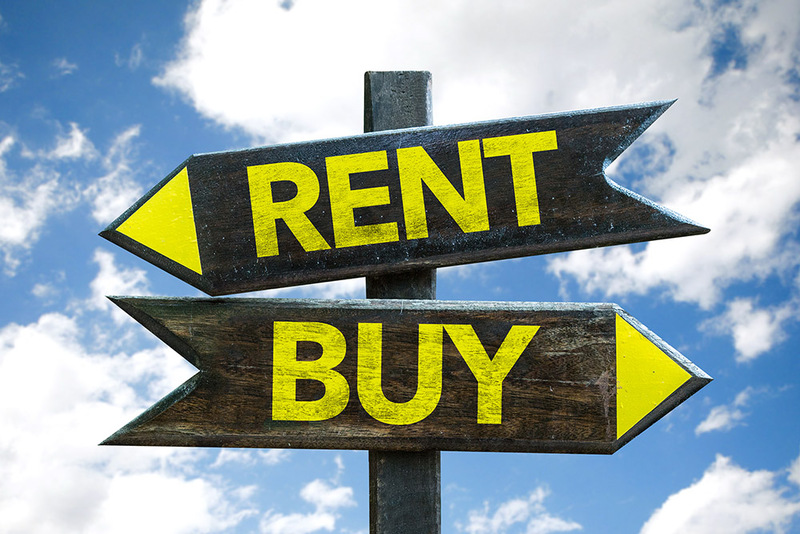 Should You Rent or Buy? Pros and Cons to Help You Decide. A home is one of the largest purchases one will make in their lifetime and is often a huge commitment. Where you are in life will determine whether or not it makes more sense to buy or continue renting. There are pros and cons to each choice, but weighing your options is the best way to determine which is more beneficial for you, and this could help you save money in the long run. Upfront costs: Buying a home entails numerous upfront costs, many more than renting. Sometimes these can be wrapped into your mortgage payment, and there are programs such as FHA loans and USDA loans that offer low or no down payment loans. However, more often than not a homebuyer should be prepared to pay a few things. Earnest Money: This is usually about 1 to 3% of the home price to show the sellers that you are serious about buying the home. Sometimes the seller will ask for less, depending on the situation. This money is paid right when you put your offer in and is credited toward your closing costs once the loan is finalized. Down Payment: As we mentioned, there are some loans that offer low or no down payment, but it’s beneficial in the long run to put down as much money as you can when purchasing a home. Best practice is to put down 20% of the total cost of the home, which on a $200,000 home would be $40,000. Again, if saving this much seems daunting, an FHA loan will allow you to put down 3.5%, and a USDA or military loan will accept no down payment! Home Appraisal: Lenders require a home appraisal in order to process a loan. These usually cost about $300 to $500, paid during the appraisal. Home Inspection: Inspectors are trained to find potential problems and defects with the property by doing a casual walk-through. Buyers are encouraged to get one as it will alert them to issues with the property, and most loan officers require it. This costs about the same as an appraisal. Closing costs: Other closing costs can include loan origination charges, credit report fee, flood certification fee, lender’s and owner’s title insurance, recording taxes, state and local transfer taxes, first month’s mortgage interest, and a closing fee. The rule of thumb is to expect 2-4% of the total purchase cost to be the amount of the closing costs. Sometimes these can be wrapped into your loan, so you won’t have to pay them right away. Can you afford these costs at the moment? Have you saved up the appropriate amount of money? If not, it might be best to rent until you’ve saved up these funds. Renting a home also has some upfront costs such as a deposit (1.5 times your monthly rent is usually the amount of the security deposit), any pet deposits, first and last month’s rent, and moving costs. Savings over time: One of the first things to consider is the price of your desired home. Consider your gross monthly income minus your monthly debt expenses to assess how much house you can buy. There are calculators online you can use to determine this. You would need to determine about how much your monthly mortgage payment would be, then compare it to your current rental rates. Keep in mind that rental prices will raise pretty much every year in a hot housing market, while a fixed-rate mortgage payment will remain the same. However, property taxes do go up also, so that’s one thing you’ll want to figure in. Homeowners also get certain tax breaks, another factor to consider. There are several other recurring costs to consider when buying a home, such as homeowners insurance and private mortgage insurance. These will usually be figured into your monthly escrow payment, and whether or not it goes up will depend on your home’s appraised value. If you have put a down payment of 20% of more, you will not need to worry about private mortgage insurance, but if you’ve put down less than that you will need to pay a PMI cost until the ratio of your current mortgage value to your home’s value reaches 78%. This is usually between $50 and $200 a month. Conversely, renter’s insurance, monthly rent and possible pet rent are the only things you have to worry about when renting. However, rental prices go up over time so more often than not, after everything is said and done, it will end up being more cost efficient to own a home after a certain amount of time. There is an article we found very helpful in the Times that talks about calculating the ‘price to rent’ ratio in order to decide which is better. There is also a handy calculator on SmartAsset.com that helps you calculate this without having to do the math yourself. With home ownership you build equity over time, each month you are putting money towards a home that you will one day own. Every dollar that you put toward your loan’s principal represents a dollar of equity. You can raise your equity over time through home improvements or city-wide raises in property values. On the flip side, your home can also potentially lose value if maintenance isn’t kept up with. That brings us to another point, in a rental, the renter doesn’t have to worry about maintenance to the home, whereas a homeowner will. These can sometimes be very costly, and should be prepared for. There are certain tax benefits you can get from owning rather than renting. Your homestead exemption exempts owner-occupied homes from a portion of the property tax burden. There are also federal tax deductions like your property taxes and interest on your mortgage that you can claim. These benefits aren’t available for renters. More creative freedom and pride of ownership are also a couple of benefits of owning a home. When you own the property, you can do whatever you want to it, where a renter would not have this option. Want to paint that wall purple? Go for it. Relocating is easier if you are renting a home, so if you’re not set on a neighborhood or city, renting is probably a better option. Another advantage of renting is that credit requirements are generally less strict. However, there are sometimes breed restrictions on pets, and many people will not rent to someone with a bad rental history or criminal background. Think about which aspects are important to you, where you’re at in life, and what you can afford when choosing between renting or buying a home. If you’re not sure, you can always talk to a real estate professional to get a more in-depth look at what is needed to buy a home, and what you can actually afford.